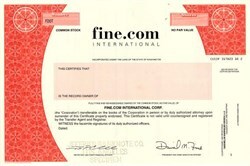 Beautiful engraved specimen certificate from the fine.com International . This historic document was printed by Security-Columbian Bank Note Company and has an ornate border around it with a vignette of the company name. This item has the printed signatures of the Company's President, Dan Fine. BELLEVUE, Wash.--May, 18, 1999--ARIS Corporation (Nasdaq:ARSC - NEWS), a leading provider of international IT consulting, training and software, announced today that it has reached a definitive agreement to acquire all of the outstanding stock of fine.com International (Nasdaq:FDOT - NEWS) for $12.25 million or approximately $4.55 per share in ARIS stock or a combination of stock and cash. The acquisition significantly expands ARIS' capability in delivering Web-based solutions including strategic web consulting, creative design and technical development. "During the first quarter, we were engaged in more than 40 e-business projects, generating over $2.5 million in revenue," said Paul Song, president and CEO of ARIS Corporation. "The acquisition of fine.com should nearly double our e-business capability in this high-growth market. Their strengths in creative Web design, e-business strategic planning and e-marketing perfectly compliment our strong enterprise application and integration expertise." "fine.com has been a pioneer in Internet consulting, building a distinguished customer base that includes Amway Corporation, General Electric, Marriott International, Inc., Microsoft Corporation, Mitsui & Co. LTD of Japan, the Nasdaq-Amex Stock Market and Intel Corporation. We are very excited about the capabilities and opportunities in the emerging e-business market that fine.com brings to our organization. Our combined talents will help our clients more rapidly adapt their businesses to capitalize on today's digital economy." fine.com has over 60 web developers, graphic professionals, internet consultants and support staff, with its headquarters in Seattle, WA and offices in Bethesda, Maryland and Livingston, New Jersey. International Data Corporation expects Internet-based e-commerce to grow from $32 billion in 1999 to over $425 billion by 2002. "ARIS' sales force, strong recruiting infrastructure and financial resources will allow fine.com to better capitalize on the tremendous opportunity created by the Internet," said Dan Fine, CEO of fine.com. "Together we can provide our customers with a powerful offering of Enterprise Internet Integration and e-commerce development services at the highest strategic, creative and technical levels." In addition, ARIS and fine.com have entered into a teaming agreement that allows ARIS and fine.com to jointly market, sell and deliver e-business projects to existing and potential customers immediately. ARIS expects the transaction to close sometime during the third quarter. ARIS will account for the acquisition using the purchase method of accounting. The company became Fine Solutions, LLC. Fine Solutions is the largest partner for Microsoft Business Solutions (Great Plains, and Axapta) in the Pacific Northwest. Fine Solutions is a Certified Partner in Microsoft� Business Solutions with earned Competencies in Dynamics AX (Axapta) and GP (Great Plains). The company implements, deploys and manages the leading Microsoft-based Enterprise Resource Planning (ERP/Accounting) systems. The company was founded by Dan Fine, an experienced entrepreneur. Mr. Fine previously founded a Microsoft Business Solutions company; In2Gr8 Corporation (pronounced �integrate�). He raised $22 million in venture funding, merged it with EYT, formerly Ernst & Young Technologies, which later was merged into ePartners.